New River Kinematics offers two educational software packages for free download: MoluCAD and RobotAssist. MoluCAD is a full-featured molecular modeling and visualization tool designed for Windows. 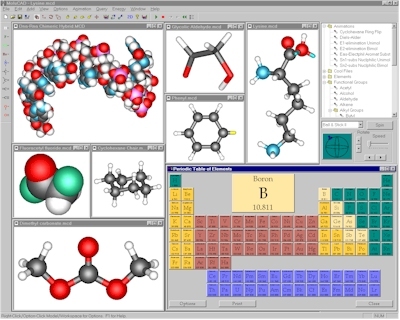 MoluCAD is a full-featured molecular modeling and visualization tool designed for Windows. It is the result of a three-year National Institutes of Health biomedical technology research project aimed at producing low-cost educational software for chemistry students. The latest version incorporates many advanced features only found in expensive workstation-based modeling packages. Ease of use, premium graphical quality, and computational robustness are the trademarks of MoluCAD. Novice users are able to quickly generate models, view them form any perspective, create reaction animations, and save all data to disk. MoluCAD is the result of a 3-year National Institutes of Health biomedical technology research project aimed at producing low-cost educational software for chemistry students. See the December 1997 NCRR Reporter article, "MoluCAD: Affordable Computer Graphics for Chemistry Students." For more information, e-mail: molucad@kinematics.com.